Bullet-points on the failings of my anatomy. Between offering too little and too much assistance. There are those who are afraid to ask, uncomfortable. A dizzy tickle that skips, then slices between us. How often have I lacked the words or energy to explain? To bear witness to myself—unflinching, unashamed. The foggy, waterlogged sensation comes first. Into Silly Putty, which everybody knows can never make up its mind. That feels the way a latte looks. There’s a squnching sound laced with dull pops. A child’s bare feet twisting on squares of bubble wrap. Then swaying, from the inside—out, an ebb and flow of fluid. Each heartbeat rocks, tugs, nudges this way, then that and back. To keep from getting seasick. Make of it a buoy or an anchor. If you catch me staring, now you’ll know. Without having to ask for help. For your own personal floatation devices? Even if you don’t touch them. Even if they aren’t aware. The tide in me is stemmed. Making me feel less alone, less adrift. But still like a thief. Leaving the taste of burnt toast lingering on my tongue. Too sharp and sour to acknowledge. I just make room for the label of liar. Those two sins are sisters anyway. The membranes stretch to contain. In the wrinkles of worn-thin places. A smearing of words on the page that deforms meaning. A warping of the sacred-familiar that disorients. Our breath for breath—skin to skin—grounding me. I used to do triathlons. Actually I spent a great deal of time training for them but only managed to compete in a couple. Swimming has stayed with me and remains something close to salvation; it keeps the holy trinity of body, mind & spirit in accord. Or as close to “accord” as a being with MS can be, anyway. While I don’t miss running at all, I miss the journeys with my bike as if I’ve lost a living, breathing, best friend. I haven’t been able to ride a bike in over 12 years due to balance, strength and coordination problems caused by multiple sclerosis. Every year I have a couple of friends who put my name on their bikes for the MS 150 fundraiser. I’m honored and grateful for their efforts. Truth is, I’m also envious. I want to be the one on the bike. I want to be the one making a difference. A deeper, not so pretty or noble truth, is that each time the MS 150 comes around I experience a mix of righteous anger and grief, with a smattering of feeling-sorry-for-myself thrown in for good measure. I figure once a year to truly allow myself to experience all of these emotions is fine, is—all things considered—fair. Like the anniversary of a loved one’s death, I grant myself a small window of time to acknowledge the life, the physical body, the health & endurance that I enjoyed before MS arrived. This year’s usual time of venting and mourning was different, somehow, from the previous years. I wasn’t sure if that was about outward circumstances—the timing of the MS 150 as it arrived amid significant changes of job and geographical location, my mother’s recent death—or some, new, inner “situation” involving the emotional struggle of illness and disability. My husband and I recently relocated from Florida, where we’d been living for almost 10 years, back to Houston, Texas where we were born and raised and spent most of our lives. We were happy to get back to the place we considered home, to family, to old friends we’d been missing. And yet that happiness was tempered by what we left behind: new friends, our beloved goddaughter Ana, and my thriving poetry in the schools project. Major life changes do require adjustments and bring up all sorts of feelings. Maybe my heightened response to the MS 150 was less about the race and more about feeling displaced and on the cusp of many transitions, including the leaving behind of people and routines and activities I would miss. One thing I know for sure is that in order to be happy, to feel a sense of purposeful urgency that makes me want to get out of bed each morning in spite of the fatigue and pain weighing me down, is that I need to feel like part of a community, to find a way to make a contribution, to be of service—which, given my education and interests, usually means something involving the Arts. As luck would have it a conversation with a writer friend—poet and memoirist Nick Flynn—led me to an organization serving the youth of Houston’s Third Ward. 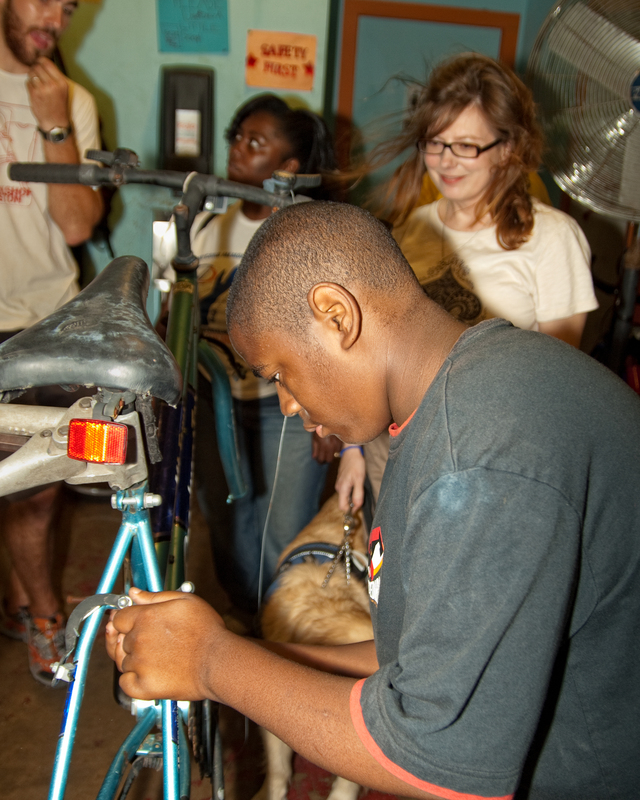 At Workshop Houston (www.workshophouston.org) kids receive tutoring and help with homework in the Scholar Shop, design and silkscreen and sew clothing in Style Shop, learn welding and metalwork in Chopper Shop, and how to build, repair and maintain bicycles in Bike Shop. The confluence of the annual MS 150 and having the configuration of bikes on the brain from hanging out at Workshop Houston, eventually led me to the lightbulb idea that I might be able to put together a bike I’d be able to ride in spite of the challenges presented by MS. I was thinking along the lines of grown-up-sized training wheels to combat my wonky balance. An internet search for possible designs that I might emulate led me to the discovery of recumbent bikes, and then to recumbent trikes. I saw picture after picture of what looked similar to a racing wheelchair, but lower down to the ground and with three wheels. Kind of like a handcycle, but with pedals instead of arm cranks. Once I knew what I was really looking for, I linked to articles and reviews and blogs—everything I could find—about recumbent trikes. One blog in particular was by a guy who had an illness that kept him from riding a conventional bike. I stared in awe at photos of him touring across the country on his ICE QNT. In many of them I noticed the familiar blue placard with the international symbol that means Handicapped hanging from the back of his seat-frame. I remember very clearly that my skin rippled with goose bumps at the recognition of that image. My brain cartwheeled with the glorious thought that if this guy could travel the countryside and highways on a recumbent trike in spite of the challenges of his health condition, then so could I. And then I cried. Because it all seemed too good to be true and I wanted it so badly. I went from dwelling in that yearly place of allowing myself to acknowledge and grieve what I’d lost, to a place of possibility. I was possessed with a rollicking, wild circus of emotions—the awe of flying trapeze and tightrope acts, the glint of sequins and swell of music, the hold-your-breath adrenaline that blooms in your stomach and swells in your throat when you think about what might go wrong, the knowledge of what can happen when things go tragically awry. And yet in spite of the anxiety and trepidation and wanting-to-look-away, the possibility and desire remained. Hope was like its own show in the center ring with three bright spotlights circling and dancing, a drum roll thundering underneath. I felt frozen and the need to hide. I felt like if I could take one simple, small step forward that everything could change. I was full of awe and gratitude to have happened upon this idea of a bike I might be able to ride, which led me to the discovery of recumbent trikes. But at first the hope was overwhelming. The aching, gorgeous possibility that one of the things which I desperately missed and mourned—cycling—might be moved *out* of the category of That Which MS Took Away and restored to me, it felt like too much to let myself want. Do you know that feeling, the one that’s half hope and half fear of hoping? It is magnificent and agonizing all at once.